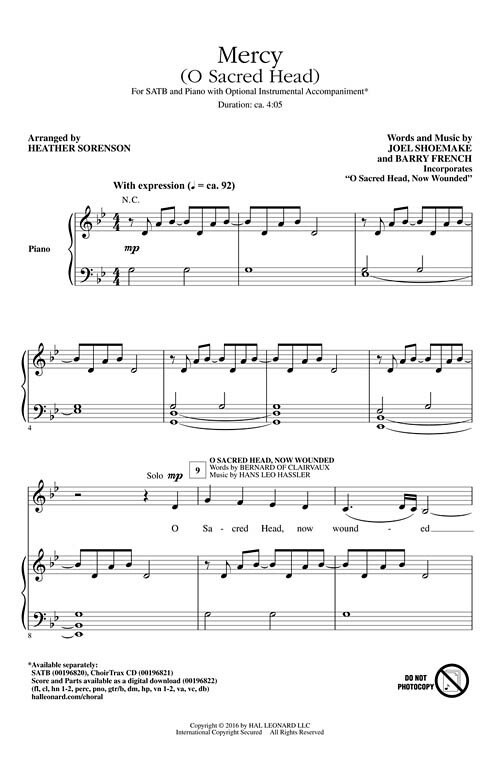 Uses: Good Friday, Holy Week Scripture: Micah 7:18; Matthew 27:28-29; Ephesians 2:4-5 A melancholy piano introduction sets the stage for an emotional Holy Week composition filled with drama and pathos. The beloved theme and text of the Passion Chorale is woven into the opening tapestry of this dramatic anthem before surrendering to a more modern chorus that pleas for mercy and forgiveness. Through repetition and careful pacing, deep emotion and conviction are felt in every note. Impactful and heartfelt! Score and Parts (fl, cl, hn 1-2, perc, pno, gtr/b, dm, hp, vn 1-2, va, vc, db) available as a digital download.